I love sharing what I’ve learned during my years of writing and editing. The best way I can think of doing that is through online courses. Every other month, beginning January 2018, I will teach online writing courses, switching off between the two below. Please contact me at Alicia@AliciaDean.com for any questions. Hope to see you in class! Alicia is an editor for an online publishing company, a freelance editor, and an author of more than 25 published works. She has given several workshops to writing groups and at conferences and has also provided one-on-one assistance to countless writers. She is now launching an online course so that more authors can benefit from her years of expertise to hone their writing skills. 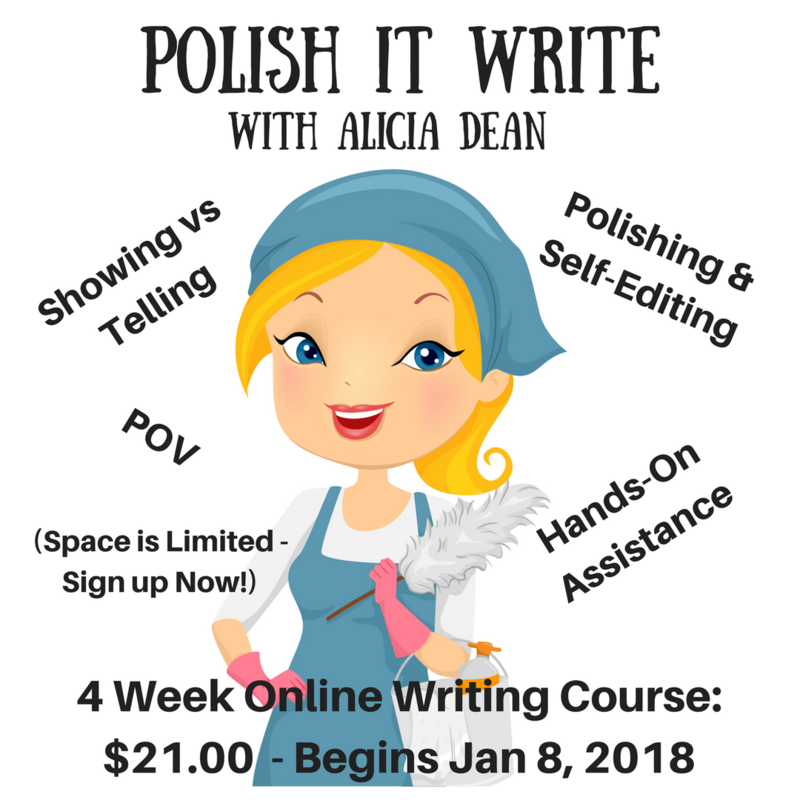 Designed to teach writers how to revise and polish their work, how to recognize and correct pitfalls, and what steps they can take to make their writing the best it can be. Each Monday, using clear examples and providing handouts, Alicia will post a weekly lesson on the below topics. Participants will have the opportunity to submit a page each week for critique, ask questions, and receive personalized assistance. You do not need to be at your computer at any particular time. Take the course at your convenience. Once students have completed the course, they may send a portion of their manuscript (up to 2,500 words) for Alicia to edit/critique. Alicia is an editor for an online publishing company, a freelance editor, and an author of more than 25 published works. She has given several workshops to writing groups and at conferences and has also provided one-on-one assistance to countless writers. Several of her books are self-published, and she has learned a great deal from her experiences and has honed the process into simple, doable steps. Designed to help you navigate the process of self-publishing, how to prepare ahead of time, and what to do after. NOTE: If you are considering submitting to a publisher, I highly encourage you to do so. The course can be customized to help you with a query letter, synopsis, etc, and the general lessons will still teach you things you need to know about the publishing world, writing blurbs, and promoting your new release. Each Monday, Alicia will post a weekly lesson on the below topics. Participants will have the opportunity to ask questions and receive personalized assistance, including hands-on help with writing a blurb and tag line. Most of the course deals with self-publishing on Amazon, but also includes a suggestion for publishing to other venues. 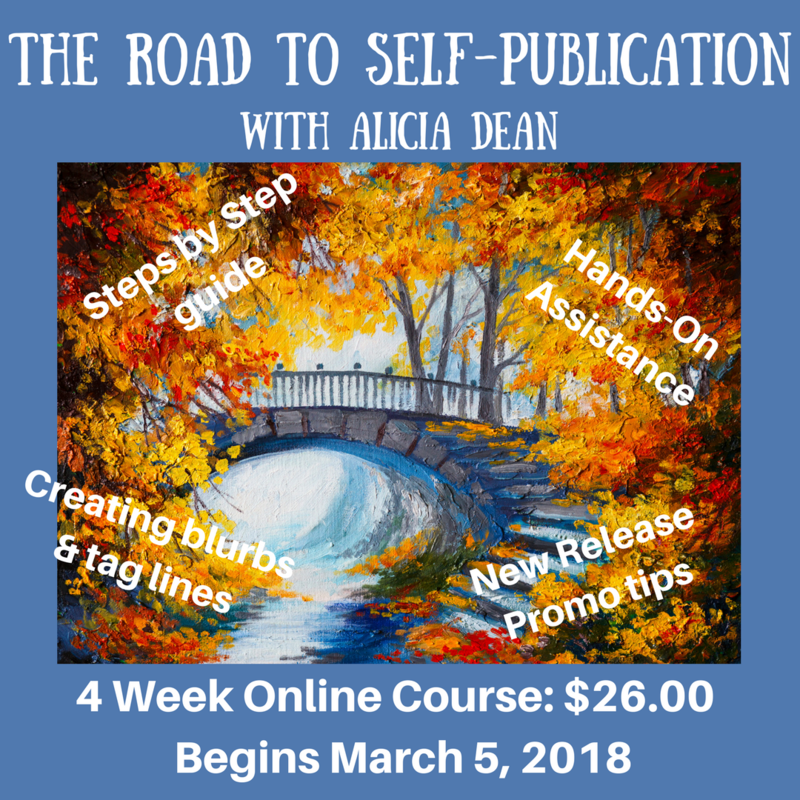 AND, when you are ready to self-publish down the road, Alicia will answer questions and help you through the process. Sign up now – Space is limited – Send $26.00 via PayPal to: Alicem68@aol.com and email Alicia at Alicia@AliciaDean.com with ‘SP Class’ in the subject line and provide your PayPal payment info and a link to your Facebook PROFILE so Alicia can invite you to the FB group.